America, for those who really have not been paying attention to the news lately, is in the midst of what could be dubbed Pope-mania. Pope Francis, the current leader of the worldwide Catholic Church, is in the midst of a whirlwind visit to the United States and has thus been dominating the 24-hour news cycle for days. The 78-year-old Argentine pontiff has been adhering to a rigorous schedule of public appearances and speeches, including a ceremonious visit to the White House on Wednesday. That’s enough to wear out any septuagenarian, so Francis can be forgiven for looking a little peaked and worse-for-wear while patiently standing in the hot afternoon sun and watching a fife and drum corps in colonial-era garb parade across a lawn. 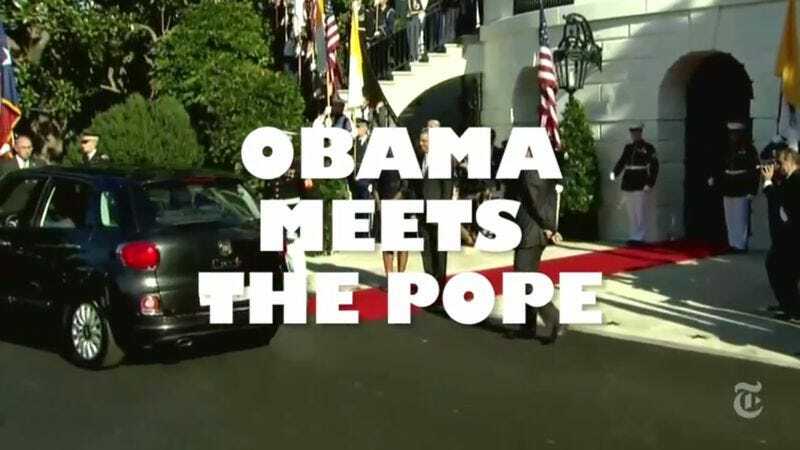 The inherent absurdity of all this pomp and circumstance is at the heart of “Obama Meets The Pope,” the latest video from filmmaker and self-described “#1 pizza boy” Dominick Nero, who lately has been using his editing skills to spoof the Emmys, Geico, and Wes Anderson. The Pope, he’s an easy target. He basically wears a cape and looks like an ancient swordsman. I saw his arrival on a muted TV in a bagel shop yesterday morning, and just seeing him standing there with that terrifying, baggy look on his face was enough to prompt me to rush back and cut this thing. As a former Catholic, I can say—Popes are weird. Churches are scary. Hopefully my video reminds us that normal people don’t wear pointy hats and strut around like vintage Kings.